Line Boring (On Application) - Heavymech Pty Ltd.
Heavymech’s Line Boring Services have been extensively utilised since 2010 by our customers where the equipment requiring the attention is too big to move on the road or where the equipment needs to remain in situ when the costs of taking it apart and transporting it to us are not cost effective. (This service is offered by application and quote only, please call us to discuss your options further). 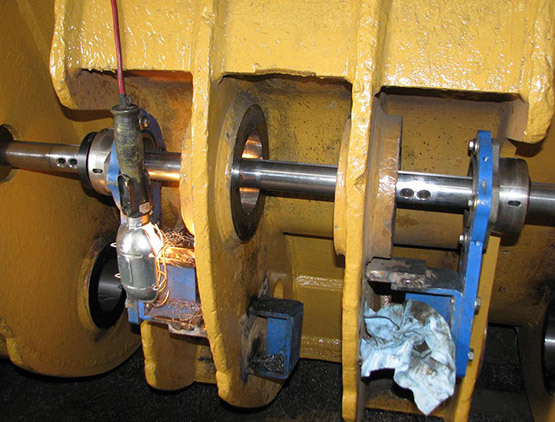 Our Line Boring Service provides customers with an alternative to lengthy down time or delays due to having to remove a single item for machining purposes off site. Dependent on the circumstances, we are able to come to your site, weld and bore the item in situ then leave. In some circumstances this has provided customers with 40% less down time and 50% less cost. For all your machining, repair and overhaul needs contact us. Copyright © 2019 Heavymech Pty Ltd.